Chocolate is one of the few things we could eat for 12 glorious days without a break. From the fussiest soufflé to the humblest brownie, chocolate rarely disappoints. That’s why it’s the perfect Christmas treat—and why we’ve created these 12 chocolate recipes to keep everyone on your nice list happy. Nothing here requires a candy thermometer or a pastry bag, so don’t worry that you’ll be stressing over the stove feeling anything but festive. 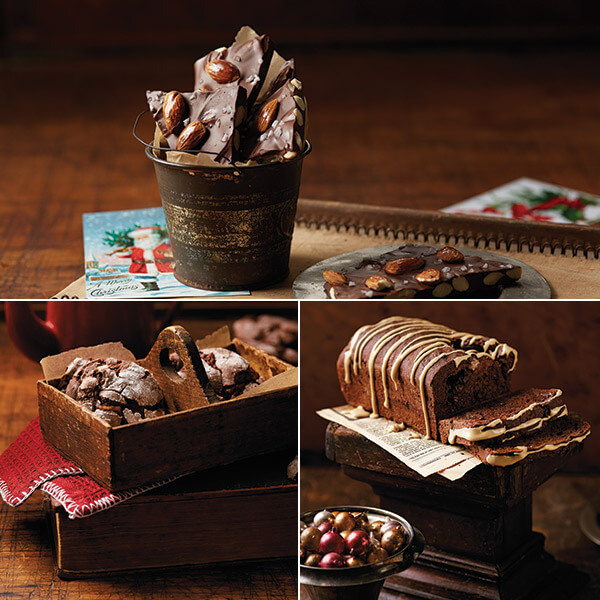 No matter how you like your chocolate, there’s a dessert that will make you feel merrier than a Christmas elf. A merry mixture of peanuts, butterscotch and chocolate. You’ll sleep with visions of this deep, dark chocolate fudge dancing in your head. An easy almond bark that will please your holiday helpers. A sprinkle of sea salt adds depth and surprise to these delicious caramel brownies. A dusting of powdered sugar makes these cookies especially merry. Jolly chocolate truffles make wonderful gifts for ringing in the holidays. A ring of moist chocolate cake with a surprise Black Russian flavor. These individual molten lava cakes can be prepared ahead and put into the oven for 10 minutes before being demolished in a blaze of chocolate glory. A genuine, creamy cocoa to revive even the weariest caroler. Brownies with a spicy-sweet kick! The holiday hostess’ best friend: a superb quick bread made from pantry ingredients and boxed cake mix. Cozy up with chocolate mousse cake made for two. Learn how to make 5 very merry treats by adding Crafters & Co. Peppermint Bark to a favorite recipe. They’re simple surprises that will add a dash of jolly to anyone’s day!